They say all good things come in threes and so we want to take you on a little journey through the vastness of the western province of Canada noble named Alberta. Imagine yourself cruising on a wide road through Alberta’s countryside – yes, exactly like in road trip movies – no traffic and cornfields for miles. Yellow and red leaves reflected in the sun or on the wet asphalt of the streets after beeing flooded by an autumn rain. That’s the area where three Velosolutions asphalt pumptracks have been built in September. Scenic, calm and laid-back. Not quite as relaxed was the building of the pumptracks, though. Due to the heavy rainfalls, typical for this season, it wasn’t easy to stick to the timetable. Claudio Caluori had to leave the Canadian Velosolutions crew after the first of three builds in Wildwood, for the World Cup Finals and the World Championships with Gstaad-Scott. He was replaced by two other Velosolutions crew members, flying in from other projects around the world. After all, Wildwood, Evansburg, and Niton Junction are hooked with their pumptracks and the worldwide phenomenon can be proofed once again: No matter how small the town is, the asphalt pump tracks are flooded by kids. Never stopping to ride, never wanting to leave, until the parents take them home. Velosolutions Canada is ready for more! And Utah, South Africa, Scotland, Latvia, and Austria are currently already on it! Such an awesome video that captures all the work from the ground up to the pure joy of the kids using it at the end. These guys were awesome to work with. If anyone is legitimately interested in more information on how to pursue a pumptrack in their community, feel free to PM me. BMXPERT build the track in st-bernard. After a number of years of hard effort by a dedicated group of bike supporters Sault Ste Marie just opened a bike park with 3 paved tracks. Ontario Bike Construction Inc. did the design and construction (you can find them on FB) working with local contractors to do the asphalt. I now have an awesome playground that is 5 min from my office for blowing off steam over the lunch hour. Just uploaded a picture of the largest of the three tracks from today's lunch time session. You can find it in the Street/Park section of photos. @ssm-henry: nice work, looks awesome! That's so cool, I feel like I'd somehow find a way to get wrecked, even though they're super safe. If there was one nearby as a kid, OH......MY.........GOODNESS! I wonder how long these pumptracks last: how long before no one rides it anymore (if that even happens) and how long before you have to re-do the asphalt because of holes and cracks. Longer than if it were a Hoots track. @cmcrawfo: truer words have not been spoken. Our local Hoots park looks like a wasteland. @gtbiker87: EVERY local hoots park looks like a wasteland. Unless you're near Taber... and then there could be corn for miles. @mugglesman: Agreed. It looks like these little hamlets are about an hour west of Edmonton though. There could be some corn fields around there, but it's definitely not their principal crop. Anyway, I think it's more the concept they were trying to market in this article, not the specific type of crops. Does anyone have an idea of the cost to build a asphalt pumptrack? The cost depends entirely on the area in square meters and the costs associated with transportation and materials. If you live in an isolated area, the costs of mobilization will rise, the same as if you live in low wet areas or any other factor that makes the work difficult (heavily treed etc.) The first step is to figure out how much of a budget you have available and an idea of the location for building. @map-guy: I understand that they are many factors in the final amount. I was looking for a ball park number for something the size of what we see in the video built in an urban area. @bikeavard: Do you have an news article or some source? @j12345: no sorry, that's just what local kids told me when I was there. Where in Alberta is this? Is it a private track? The pumptracks are in Yellowhead County west of Edmonton, in three small towns with populations around 1,000 each. The development is part of a recreation initiative to get kids off their asses and out in the fresh air. There is also a tourism component, as the pumptracks are between Edmonton and Jasper, and maybe riders on their way to Hinton and the mountain parks will stop off for a quick rip and a meal. The pump tracks are open to the public. All three locations are in Trailforks with photos. Search for Evansburg, Niton and Wildwood. 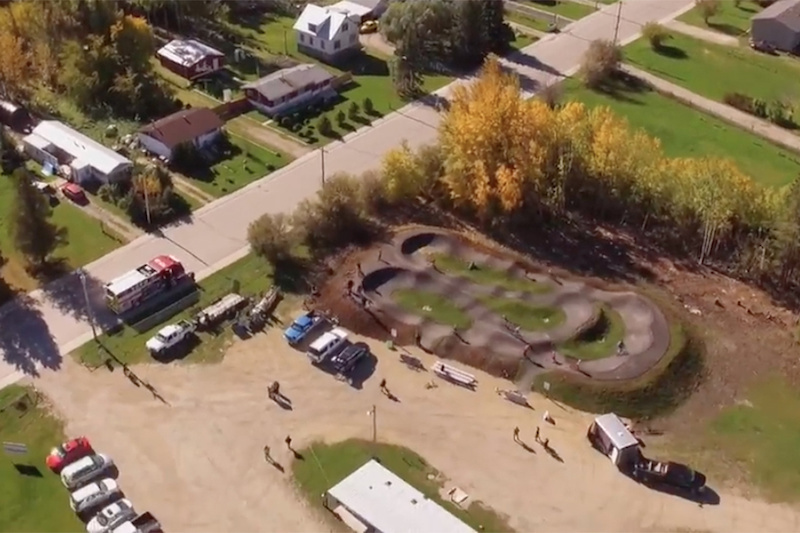 Meanwhile in Calgary the most populous city in the province we have to struggle tooth and nail with buracracy to get a dirt pump track, that will one day have a skillz park too but no jumps. There are tennis courts all over the city not being utilized, and the city is gung ho to stop any trail riding. Wtf is wrong with these ppl. @pinkrobe: thanks for the locations. I travel through that area for work all the time....looks like I'm buying a small bike for next year. Dam it. @pinkrobe: Woops meant to say thanks could't have said it better myself. @Gasket-Jeff, hopefully examples like this will start changing that. 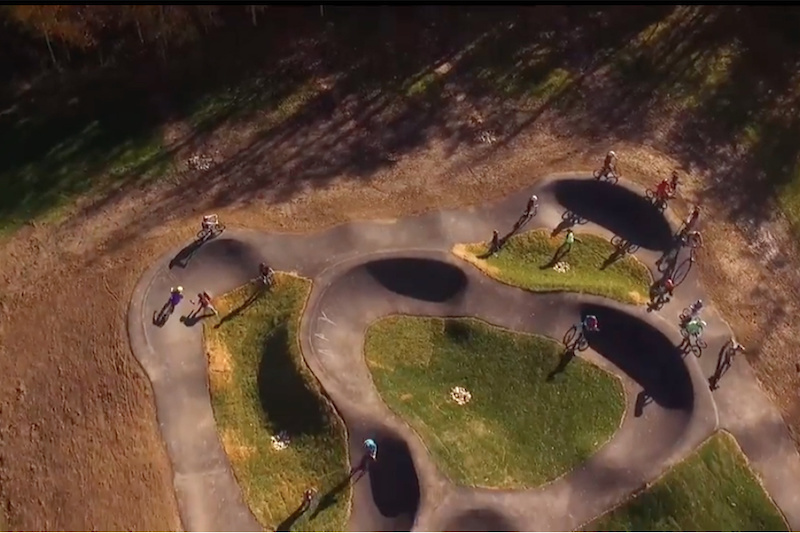 We are starting to see more and more acceptance of trails, bike and skate parks in the scope of Parks and Recreation. The days of tennis courts and unused ball fields are changing. @Gasket-Jeff: That's because city property is worth more, and you have more people making complaints about things. Most Tennis courts are sponsored by clubs, or have fees from surrounding residents to have them there, too. If you build something in the corner of an unused field of a town, nobody cares. @Gasket-Jeff: I did a #pechakucha [the #Enduro of PowerPoint presentations] for a group of Parks people from across Canada yesterday, on the 10+ year struggle to get a public skills park built in Calgary. When I was writing up the script, I oscillated between anger and numb despair at how f***ing painful it has been to get where we are. At least the Fish Creek skills park is built - my ulcer is getting smaller now. It is now official. Unless you can push a stroller on it, Edmonton has the worst bike network in the province. Although, it does have the real estate along the river valley to make a IMBA epic. I cant see Edmonton building anything. They are starting to absorb the current park areas with infrastructure and housing, to 'rejuvenate' the inner core. And anything outside that, is all subdivisions setup by companies who try to cram as many houses in them to make as much income as possible. I do remember seeing plans for a skills park in Terwillegar, but I am sure that is history now. Scooters and skateboards won't be an issue by next spring after a -45 winter does its work on the asphalt I'd bet. I was also realy surprise to see Velosolution puting asphalt on "bare" dirt. No fondation. BMXpert built all there track with nothing less than 6" of compacted gravel Under the asphalt. @becik: Or just leave the cracks in the asphalt and eliminate the scooters and skateboards, double win! all good @robaussie99 and @becik . don't worry, we built with proper road base, we have a little bit of experience from around the world, including very cold places ;-). Did you read the article??? ?